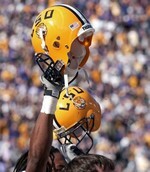 LSU Tigers crowned NCAA College Football’s BCS Champions … HEAR THEM ROAR! The LSU Bayou Bengals defeated previously #1 ranked and over-rated Big 10 power Ohio St 38–24. After spotting the Ohio St Buckeyes a 10 point lead in the first quarter, LSU scored the next 31 points on way to victory. Here is the cold hard reality for Big Ten fans, the SEC is a better and stronger conference. Oh, and yes they are faster. No. 2 LSU danced, dodged and darted its way into the end zone Monday night, turning the BCS national championship game into a horrible replay for No. 1 Ohio State. It was over early, with Matt Flynn throwing four touchdown passes in a 38-24 win. There seem to now be three certainties in life … death, taxes and Ohio St will get routed by an SEC team in a BCS bowl. The Buckeyes are now 0–9 in bowl games against teams from the South East Conference. This includes 2 straight losses in the BCS title game the last two years by a combined score of 79 to 38. Even the last minute cosmetic TD by Ohio St and coach Tressel cannot hide the fact that the Buckeyes were dominated again by a SEC team. Let’s go out on a limb and say the SEC is good. 1. The SEC is a faster conference. Fast does not just mean at running back, it means at every position. To actually compare the team speed of the two conferences is comical. Ask the Buckeye wide outs who could barely get any separation from the LSU defensive backs if the SEC is not faster. Ask the Buckeye QB just how fast the LSU defensive linemen were tonight. 2. The SEC is a better and stronger conference from top to bottom. Week in and week out the SEC teams battle each other in what can only be described as organised rumbles. Tonight the LSU Tigers and the SEC showed that playing a tough schedule and being battle tested with losses is a greater preparation for being #1 than just having many wins against little to no competition. This flies in the face of what Ohio St and other Big 10 teams are guilty of. It is no fluke that OSU racks up 10 and 11 win seasons that gets them into a BCS bowl and a BCS Championship, only to have them lose to quality opponents. When your quality win is against a team that lost to Appalachian State, those that pick teams in the polls may want to re-examine who they give a #1 ranking to. I beg the NCAA to please put a three year ban on Ohio St from participating in the BCS Championship. Please we beg you. Stop the nonsense and the madness. Stop rewarding teams for playing weak schedules in weak conferences with no conference championship. We are tired of seeing the Buffalo Bills, sorry I mean the Ohio St Buckeyes play in a game they do not belong and get badly beaten. Give a more deserving team a chance. Better yet … GET A DAMN PLAYOFF SYSTEM!!! Let me be the first to post. A playoff would be great. I say let the winner of #1 and #2 play the winner of #3 and # 4. Simple as that. I said it last year and I’ll say it again this year. The worst team in the SEC could beat Ohio State. The people want a good competative game. Ohio State really blows. Let me add.38-24 It wasen’t that close.Ohio State should thank Les Miles for not running it up. More proof the BCS sux @ putting together a championship game. REMOVE THE C. Call it what it is. Georgia president Michael Adams thinks the BCS needs a playoff system. NEW ORLEANS – University of Georgia president Michael Adams certainly knows how to spoil a party. We only lost 5 seniors.So who will play OSU in the BCS Championship next yr !! !lolOhio is 1 for 3 in the BCS Championship!! !